Do you have Japanese Knotweed or is it encroaching onto your land from your neighbour? Eradication of Japanese Knotweed in Cheadle is important, as this ensures that it does not spread any further causing nuisance and damage. 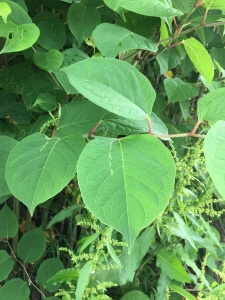 The root system of Japanese knotweed can fork out to approximately 7 metres; therefore, they can cause structural damage to buildings and foundations, it can grow through walls and between paving. Just a fingernail sized piece of rhizome from a Japanese Knotweed can cause a new plant to grow. The spread of this invasive weed can be done by a water source, like a river carrying it downstream to another area, where the rhizome will take root and grow. It can also be transferred by animals claws like badgers or foxes. Contaminated soil through fly tipping is also very common for new growths of Japanese knotweed especially on industrial sites. It is not illegal to allow it grow on your site or in your garden, however, it is illegal to allowing it to spread. If the Japanese Knotweed is also within in 7 metres of a habitable area or is causing damage to outbuildings, drains etc, the outbreak is classed a severe. As a result, the best course of action would be for the eradication of Japanese Knotweed in Cheadle or throughout Staffordshire and Cheshire, to take place. We have all the necessary qualifications to carry out the eradication of Japanese Knotweed safely. Our PCA qualified surveyor ensures we abide by RICS guidelines. Giving you the peace of mind, knowing that your Japanese Knotweed outbreak is being dealt with by an expert. Contact us today on 0800 1337 444, to arrange your site survey and management plan, for the eradication of Japanese Knotweed in Cheadle. Alternatively, send us a message via our online contact form.